In 2006, the VanDusartzs were splitting wood with a conventional mall to heat their home and shop. Charlie VanDursartzs thought there had to be a better way to split wood. A way without using the typical hydraulic ram style splitter. Lifting logs off the ground four times to split them just didn’t make sense. Nor did it make sense to leave large logs behind simply because they couldn’t be lifted by hand. Charlie went to the shop and started tinkering with hydraulic motors and old truck parts to create the first Hands Free Log Splitter. Though the first one was very crude, it operated efficiently and Charlie thought he’d solved his log splitting dilemma. When friends and neighbors saw the invention, they said he should patent it and go into production. At first he thought they were crazy but with the support of his wife and others, he applied for a patent and it was issued in 2010. With the sale of the first few units it was obvious that Charlie wasn’t the only one faced with this need, so U.S. Pride Products, LLC was created. With creativity at full throttle, Charlie expanded on what his creation could do. He designed the pivoting head to allow the addition of attachments suchas a post hole auger, a cement mixing drum, a power take off shaft, andmost recently, a very versatile, and unique, stump grinder. The Hands Free Log Splitter is now available in three sizes to accommodate the individual home owner (the HF100 model), the fire wood processor, landscape and tree removal people (the HF300 model) all the way up to the logger/tub grinder businesses (the HF600 model). 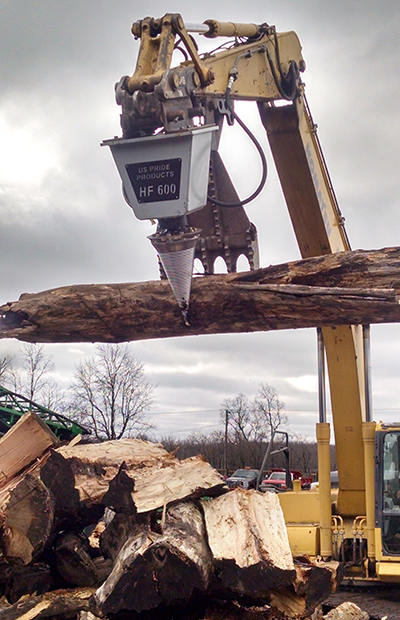 Sales of the Hands Free Log Splitter have continued to grow. As the need arises, new products will be added to the US Pride Products product line.